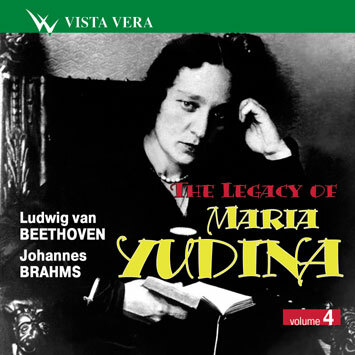 Piano works by Ludvig van Beethoven form a basis of Maria Yudina's classical repertoire. Over the time of her almost half-a-century artistic career she played 24 Sonatas, two Piano Concertos (No 4 and No 5), "Fantasy" for Piano, Choir and Orchestra, op. 80, several Piano variations. She read in his music a tragic picture of life of a zetetic and suffering mind. She flowed together with it in sorrow and joy. Sometimes Yudina felt that she was too weak to comprehend an inconceivable greatness of his genius. In 1923 Yudina wrote to Maximilian Steinberg: "I give up playing Beethoven because I still do not dare to play him. I can look at the stars and planets but the Sun makes me blind and I cannot and dare not play being blind". But then moments of indecision gave turn to a passionate desire to express her understanding of the great music. Yudina experienced this kind of doubts and even desperation every time she turned to a grandiose Sonata, op. 106, Hammerklavier, which Samuil Feinberg described as a sonata of "titanic contrasts". Musicians who observed her closely recall that even when going on to the stage she used to cross herself fervently and exclaim: "Oh God, why on earth one condemns oneself to such torments". But after playing doughtily and mightfully two first exclamations of appeal she used to forget her nervousness and even forget herself. She remarked once that "Beethoven wrote for the whole mankind, and he contained in himself not only the mankind but the whole cosmos". The recordings on this disc probably amaze most of all with a spontaneous development of the panorama of the musical events. Yudina irreproachably delivers the whole conception of the sonata in its integrity yet she makes an impression of a brilliant improvisation. There is nothing stark in her performance, no final shape, everything lives and breathes. In the first movement where unpredictability underlies its structure Yudina very flexibly and freely uses tempo. Very convincingly she makes even more agonic deflections than the author intended it. The third movement, Adagio represents an emotional center of the sonata and is full of prophetic insights into the future. Yudina appears here as an artist of this future and achieves real heights of the expressiveness. The final movement, the fugue, appears as if from non-existence, out from the vague contours of Largo. It is satiated with colossal intellectual and spiritual energy. Yudina plays the Fugue with amazing mastery of technique and at the same time with great ease. Iohannes Brahms' works also figured prominently in Yudina's repertoire. She played all three sonatas, Variations On A Theme By Handel, Piano concerto No 1, intermezzos, capriccios and other pieces. At the end of her artistic career she more often performed his latest compositions, that is intermezzos. We can not detach now Yudina's interpretations of those masterpieces and her remarkable article 'Six Intermezzos by Iohannes Brahms" that was written in 1968 - 1969. All together it represents a rare combination of critique, poetry, philosophy, and music. Yudina examines the genre of intermezzo in a historic prospective. She discovers really striking parallels in the works of art of geniuses belonging to different epochs and cultures, from ancient Greece to our time. She takes example of Iohann Damaskin, an 8th century Byzantine theologian who was also a poet and composer. She refers to his transparently peaceful elegies, full of lyrical and philosophical reflections about death that makes equal all human destinies. Yudina also writes about Alessandro Botticelli and his ineffably soft almost ethereal portrait of women as light in their curling dresses as they were living in the clouds. Both Botucelli and Brahms, Yudina says, stand on the threshold of life and death, they do not and did not condemn anybody. Boticelli's amazing colors sometimes have something in common with brightest and most unexpected sound phenomenon by Brahms, with some line of chords or sudden appearance of a new theme or its staggering reconstruction". Intermezzos as performed by Yudina sound like sincere monologues and confessions. She reveals new notional sides of these compositions reaching, as Grigory Kogan said, the heights she conquered when performing Iohann Sebastian Bach, Piano Concerto by Mozart, Beethoven's Hammerklavier and Piano Concerto No 2 by Prokofiev". What strikes us in her performance is a perfect sense of form, fantastic richness of colours, and plasticidy of the musical phrases. This is probably the incomprehensible "Yudina's phenomenon", an eternal enigma of the genius, the mystery of her great art. Cover. Maria Yudina. All the photographs for the series of CDs "The Legacy of Maria Yudina" were kindly granted by Alexander Kuznetzov from his personal archive.Alexander Kuznetzov was a friend and student of Maria Yudina.